A lot of articles on financial innovation and disruption in the FT over the last few days. Here, John Gapper argues that tech firms aim at using the existing financial system rather than challenge it. Here, Martin Arnold argues that banks shouldn’t forget their traditional branch network as this is how they make money through their oldest and wealthiest clients. Here, Luke Johnson argues that crowdfunding is riskier but also more exciting and, in a way, is the future. John Gapper is right to point out that the regulatory and capital costs of setting up new bank-alike lending entities are very high. Yet he probably overstates his case. P2P lenders do not provide bank-type services: technology has enabled disintermediation by allowing investors to lend money (almost) directly to borrowers, but the money invested is stuck and does not represent a means of payment, unlike bank deposits. P2P lenders have the ability to take over a large market share of the lending market; and their business model does not require a high operating, regulatory and capital costs base (at least for now…). This is where the traditional intermediated lending channel could effectively approach death. On the other hand, P2P lender cannot handle deposits and banks still have a near-monopoly in this area. Of course, we could imagine a 100%-reserve banking world in which the lending channel has moved entirely to P2P lenders, mutual and hedge funds and equivalent, whereas the deposit and payment system has moved entirely to Paypal-like payment firms. And this excludes alternative options offered by cryptocurrencies. In this world, banks are effectively dead. Banks can also survive by benefiting from those technologies (if ever they dare touching their antique IT systems…). As I’ve been saying for a while, banks can leverage their huge customer base to set up their own P2P/crowdfunding platform. This has already started to happen: RBS just announced the creation of its own P2P lending platform, Santander announced a partnership with Funding Circle, Lending Club is developing partnerships with many US banks. Banks could earn a fee from referring customers to their own (or third-party) platform, while deleveraging and reducing their on-balance sheet credit risk. Investors would earn more on those investments than on time deposits, but bear some risk. Whatever they decide to do, banks will have to adapt. But timing is key. Gapper referred to this recent, excellent, Deloitte report. They explain the margin compression effect (due to low base rates)*, which depresses banks’ profitability and adds another challenge on top of those that tech-enabled competitors and regulation already represent. According to them, closing down branches and moving online does not sufficiently slash cost to offset the decrease in net interest income. Closing down branches too quickly could also hurt banks by alienating the part of their client base born before the internet age. Deloitte provides evidence that a radical restructuring of IT systems could significantly improve returns, but this requires investments, which banks aren’t necessarily willing to undertake in a period of below-cost of capital RoE. As the internet makes it easier for customers to compare pricing through aggregators and hence more difficult for banks to ‘extract value’ from them (what they call ’privileged access’), they recommend banks enhance ‘customer proposition’ (i.e. use ‘big data’) and focus on SME lending. As I’ve argued on this blog, capital regulation makes this difficult. They also indeed support the idea of in-house P2P platform, mostly to focus on local SMEs. This would help with capital requirements by maintaining SME exposures off-balance sheet, the risk borne by customers. Banks could effectively become risk assessment providers: rating lending opportunities to help customers (which include investment funds that don’t have such in-house capabilities) make their investment choices. * Ben Southwood reiterated that interest rates are determined by markets and not by central banks. I already wrote responses to those claims here and here. Scott Sumner just mentioned his latest post, so I thought it would be a good idea to share Deloitte’s insight and own explanation of the margin compression effect and why “the spreads between Bank Rate and market rates seem to be narrow and fairly consistent—until they’re not.” In reality, lending spreads fluctuate only slightly when rates are above a certain threshold (i.e. banks’ risk-adjusted operating costs) and widen when they drop below it (explaining the “until they’re not”; see my previous posts). The fact that the “until they’re not” occurs does not imply that lending rates are “determined by the market”. The interest rate paid by banks on current accounts is typically lower than those paid for lump sum deposits (and the rates paid to borrow in the wholesale markets). However, this interest rate does not reflect the full cost of acquiring and servicing these current accounts. In the past, these acquisitions and servicing costs were offset by the fact that banks did not have to pay very high interest rates on current accounts. Until the financial crisis, central bank interest rates (the ‘base rate’) were traditionally much higher. This meant that current account rates could easily be 500 or more basis points (hundredths of a percentage point) below lump-sum deposit rates. Because base rates are at unprecedented lows, that maths does not work. Base rates have been low since 2009, and central bankers have signalled that they are likely to stay that way for some time yet. 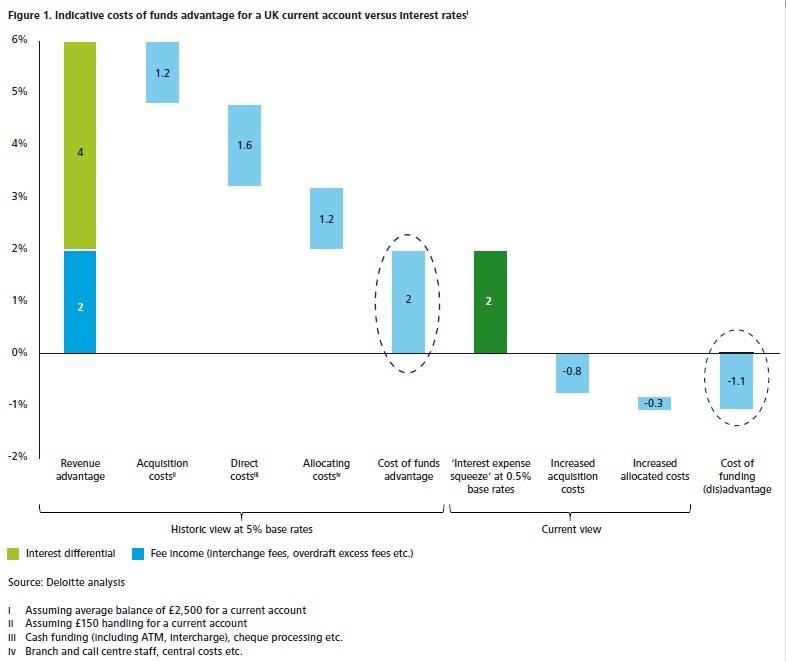 Figure 1 shows the economics of current accounts in the UK, where banks typically do not charge for them. A 200 basis point margin generated by current accounts when base rates are at 5 per cent turns into a 110 basis point loss at a 0.5 per cent base rate. Another excellent post! A small disagreement, though: I don’t think it’s possible to get rid of fractional banking. Hayek wrote in Monetary Theory and the Trade Cycle that fractional reserve lending is too lucrative. If you forced 100% reserves on banks, you would still have whole life insurance companies that do essentially the same thing. If you kill it in banking it will pop up elsewhere. And I think you’ll see that investment banking engages in fractional reserves, based on Gorton’s Slapped by the Invisible Hand. So money market funds don’t do fractional banking, but they lend their money short term to entities that do. In the Dutch Republic of the 18th century fractional banking was illegal, so merchants did it with bills of exchange. BTW I read Scott Sumner’s piece claiming that the Fed doesn’t determine market interest rates. He is a perfect example of your claim that economists don’t understand banking or finance. That is so true. Greenspan used to claim that the Fed doesn’t determine long term rates. The ignorance is astounding. But it’s also an ignorance of basic microeconomics, which I find egregious and prolific among macroeconomists. The issue is very basic supply and demand. If the Fed supplies banks with more cash by buying their bonds, the supply curve of loanable funds must shift to the right and that reduces the interest rate if demand doesn’t shift as well. Even in my econ version of rocks for jocks class understand that. Actually, I don’t really believe we can get rid of fractional reserve banking either. We can try to, and it might work for a while, but unlikely to work in the longer term. I believe this is because 100% reserve cannot accomodate the fluctuations in the demand for money. If money becomes too scarce, people are going to start using other media of exchange. We could believe that prices would naturally adjust downwards to accomodate the change, but even in a tech-advanced society, some menu costs remain.